Gwen was born and raised in Pincher Creek, Alberta. After high school, Gwen went on to college to study in office administration. She worked at two hospitals southern Alberta. It was in Lethbridge that she met her cowboy and future husband, Dave, who had come to the hospital injured from steer wrestling. A short time later she found herself in Fort St. John. Gwen was a devoted mother and grandmother. She followed her two daughters through bowling, rodeo, figure skating, 4-H, and high school rodeo, volunteering endless hours and enjoying every minute of it. She was very involved with her grandson in his efforts to raise money for school band trips. For many years, the annual Fort St. John rodeo was a pride and joy of hers, and she appreciated the loyal group of volunteers that she worked with every year. 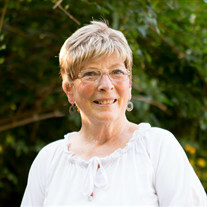 Volunteering was a big part of Gwen's life, and that's how she met so many wonderful people. One of Gwen's favourite outings was getting together with the lovely ladies of the Birthday group. She always looked forward to those lunches and socializing. Gwen was also a member of the Oil Wives for several years. Gwen enjoyed bowling, and not only for herself but coached for a short time as well. During Gwen's life, she was a business owner and very involved in her company's day-to-day operations. She loved spending time outdoors - working cattle and haying with Tim, and spending time in her garden. Gwen was a kind, loving and supportive person to everyone she met. She always had time to chat or to lend a helping hand. She was always smiling and so easy to talk to. Gwen is survived by her sisters Myrna (Eric) Wright, Margaret Brucker; her daughters Lisa Ferguson and Charlene (Mike) Barren; beloved grandchildren Riley, Paige, Brooklyn, Julia and Adam; life partner Tim Bruun; and nieces and nephews Wade, Laura, Jody and Jason. She was predeceased by parents Jack and Annie Ledingham, husband Dave Ferguson and grandson Wyatt Ferguson. A Celebration of Life will be held for Gwen on Tuesday, August 21st at 2:00 pm at the Lido. Please join us to remember this wonderful woman. If you would like to make a donation in Gwen's memory, you can do so to the Fort St John Palliative Care Society or to the charity of your choice.